Since August 2017, ZF, a global leader in driveline, chassis and safety technology, has been retrofitting a section at one of their plants in Friedrichshafen, Germany with intelligent systems in order to streamline delivery logistics and internal production material flows. The project has been dubbed the ZF Model Factory. ZF hopes to simultaneously satisfy two of its technology challenges. Firstly, by developing and marketing practical solutions for intelligent transport systems, such as trucks, intra-logistic tractor vehicles and industrial trucks. Secondly, by contributing to other autonomous driving development activities. The experience gained from this project may shorten the development time for sensor, camera and intelligent control systems, such as ZF proAI. In addition, by connecting Industry 4.0 with autonomous transport systems, production can benefit from more efficient processes. Modern industrial production is all about the turnover of goods. About 70 percent of the movement of goods during the production process consists of materials transport before the materials can be further processed by machines or other assembly equipment as part of the value-added chain. Manufacturers who organize the delivery and transport of components to workstations are able to see considerable improvements in efficiency and productivity with this connection. This project starts one step prior to the receipt of the raw material. Currently, it is not usual to have the specific time of arrival for a truck from a forwarding company. Waiting times at the gate and incoming goods area are normal and transport papers must be entered manually into the materials management system. The ZF Model Factory team is working together with experts from supply chain management on a scenario that is aiming toward digitalization, shorter waiting times and the optimal use of downtimes. A tracking system keeps ZF, as the goods recipient, informed of the location of the delivery truck at all times and can predict its arrival time down to the minute. It also records whether the driver has to maintain break times after delivering the goods. Unloading times are therefore scheduled to coordinate with the driver’s break times. It is also conceivable that the trailer can be disconnected prior to entering the company’s grounds and be moved to the incoming goods area by autonomous transport systems. BLE tags record digital data about possible shocks or other events during the freight transport. This data, as well as information from the shipping documents, can be transmitted digitally to the materials management system. As soon as the delivery truck approaches the company’s premises, the necessary forklift trucks are assigned to the unloading area. This can considerably reduce truck idle and unloading times, and eliminate long wait times at the gate. Every day, several hundred assembled ZF commercial vehicle transmissions leave Plant 2 in Friedrichshafen. These transmissions consist of up to 1,000 individual components. With over 100 large shipments per hour, the logistics process comes together in the final assembly area. 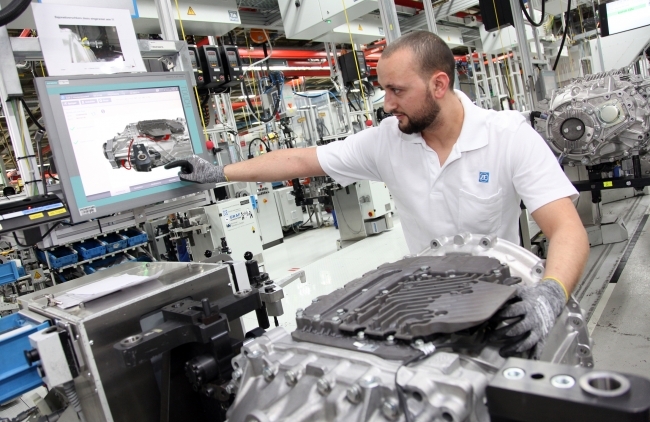 For ZF, as for any production company, defining the logistics for the assembly processes is of significant importance. In this scenario, the ZF Model Factory is setting a new trend as so-called “delivery” of material to the assembly stations, including preparation, is being done autonomously. The starting points are today’s milk-run trains that bring the goods to assembly in the precise production sequence (“just-in-sequence”). Material distribution and milk-run trains are controlled manually. The ZF Model Factory has completely done away with the classic milk-run trains. Instead, autonomous transport systems directly supply the containers storing the pre-assembled parts to the assembly area. With this approach, logistics processes can be better and more precisely controlled. In order to optimize the set-up of these processes, the material flow logistics planners from the ZF plant are directly involved in the Model Factory. Additional initial use cases will be implemented throughout the year and then continuously developed. In the meantime, passenger car and commercial vehicle sectors will also benefit: Experience from the model factory is directly incorporated into advanced engineering for autonomous driving functions.